Ronnie Swan | The Spartans FC Official Website – Live together. Play together. Win together. Ronald Lewis Swan, the son of Jimmy Swan, a civil servant and Jenny, his secretary wife, was brought up in Baird Drive in the Saughtonhall area of Edinburgh. He was a bright boy who spent his whole school career at George Watson’s College. He was a talented sportsman and his many sporting skills were developed alongside his academic abilities. At school, he played rugby, cricket and athletics. At rugby, he played in two exceptional teams, one going through the season unbeaten and the other – the school first XV – only losing once. While playing in the first XV, he represented Edinburgh schools against Glasgow schools. He also enjoyed playing cricket and made his way into the school’s first XI. In athletics he is shown winning the annual March Hare Race on a school film that has been shown regularly to subsequent generations of Watsonians. In the same year he won the school mile race. Outside of school, he played football for his local boys’ club, Saughtonhall, and enjoyed cup success with them. National Service beckoned and Ronnie joined the Royal Horse Artillery. Initially, he was posted to Palestine. With the formation of Israel in 1948, the British pulled out of Palestine and Ronnie was moved to Egypt. In the army, he carried on developing his footballing skills and played for his regimental team. On being demobbed, Ronnie returned to Edinburgh. He gained entrance to the School of Dentistry at Edinburgh University and duly qualified LDS RCS (Edin). As well as coping with his academic studies at Edinburgh University, he carried on his love of sport, and would go on to earn a double blue in both football and rugby. He captained the first XI football team to Queen’s Park Shield success and it was during this time that he played for Scottish Universities against the English Universities at Westerlands, Glasgow. This was to be a landmark occasion. On Saturday 20 December 1952, the second half was the first ever televised football broadcast in Scotland. Following his football successes, he decided to play rugby again and quickly rose through the ranks to the first XV and represented Scottish Universities. After university he would play for Watsonians at rugby, cricket, athletics and golf. While playing for his old school, he was selected to play for Edinburgh. He had a reputation as a drop goal specialist. He was well aware of the importance of healthy hands for his career as a dentist, so he returned to the game of football. He joined Spartans, who had been formed by two of his university team-mates in 1951. These were the first steps to him becoming “Mr Spartans”. For the next six decades he held almost every position in the Spartans. He played in the 1950s and 1960s and was persuaded to make the occasional appearance in the 1970s. He was Club Captain for several seasons. At the 1965 AGM he was elected club secretary, a position he held with distinction for more than 30 years. At the 1971 AGM he was handed the additional duties of club treasurer. Ambitions were changing at Spartans and along with some strong characters, including Jimmy Dunnett, joining the club as club captains combined with Ronnie’s leadership, drive and off the field organisation the Spartans won their first East of Scotland League championship in season 1971/72 as well as their first success in the King Cup in 1973/74 season. Two years later, the changing ambitions of the club were reflected in the move from Canal Field to City Park. Ronnie completed all the formalities and negotiations for the club’s application to and acceptance as members of the Scottish Football Association. This was important, as the ground being enclosed meant the Spartans could enter the Scottish Qualifying Cup – which they won for the first time in 1978. Winning allowed them to progress to the Scottish Cup proper with its attendant publicity and income. The following season, in the Scottish Cup’s second round, they defeated League side East Stirling 3-2, before going on to lose narrowly to Meadowbank Thistle 2-1 in the following round. Success on the field became the norm through the 1980s and 1990s and Ronnie emerged as the public face of the Spartans, handling the new-found pressures of the press and media with ease, humour and respect. 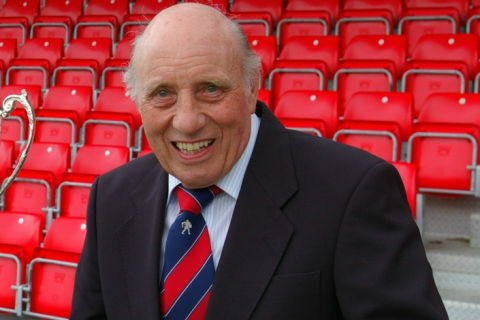 In 1987 he succeeded Harry Dunnett as club president. In 2001 he organised and chaired the club’s 50th anniversary dinner. As his involvement on match day organisation reduced, following his retiral from dentistry, he was appointed as honorary president. In 2009 the Spartans moved from City Park to their new ground at Ainslie Park. The occasion was marked with the Ronnie Swan Trophy being donated by club lawyer, Jim Martin. Team names on the trophy so far are the Spartans, Hearts, Ronnie’s two teams and Manchester United. Everyone who played for or was involved with the Spartans has many fond memories of Ronnie. In particular, he excelled as the master of ceremonies at the club’s annual dinner. Ronnie was in his element: from the minute he rapped his gavel on the top table we knew who was in control. He was a superb speaker, raconteur and his dry, wicked and often risqué sense of humour guaranteed an evening of fantastic entertainment. Ronnie Swan epitomised everything that is good about the Spartans. He was a true Spartan, he was a loyal Spartan, he was a great Spartan – he was Mr Spartans! He was a life member of Baberton Golf Club, the same club that his father had been a member of. In 1975 he won the summer singles title and in 2000 with his foursomes partner, Willie Lyon, he won the winter foursomes title. Ronnie was either captain or on the committee for all the clubs he played and regularly spoke and entertained at club dinners. He really did inspire and encourage so many people to be involved with amateur sport. Ronnie practised dentistry initially in Gilmore Place and later in Comiston Road, where he worked until he retired. He married Mary in August 1958, his daughter Valerie was born in 1960 and his son Graeme completed the family in 1965. Ronnie welcomed Valerie’s husband Gary and Graeme’s wife Adele into the family and he and Mary became very proud grandparents of their four grandchildren. In 2006 Ronnie was diagnosed with Alzheimer’s and he spent his final days in the North Merchiston Care Home. Ronnie Swan was a committed family man, he was a committed dentist, he was a committed sportsman and he was a committed leader. He was one of that rare breed of talented individuals who excelled in so many areas of life, who accepted talent and responsibility with modesty, honesty and dignity.